Chocolate crunch Barfi -A lovely sweet made with chopped cashew nuts, almonds,pistachio nuts, cereal-corn flakes,rice crispies ,cocoa and golden syrup .Topped with delicious smooth milk chocolate. 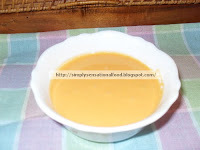 Simple and easy to make using basic ingredients. 2. Melt the butter, cocoa powder and golden syrup in a pan. 3. Add to biscuit, nut and cereal mixture, and mix thoroughly till everything is coated. 5. Melt the chocolate and pour over the set mixture. 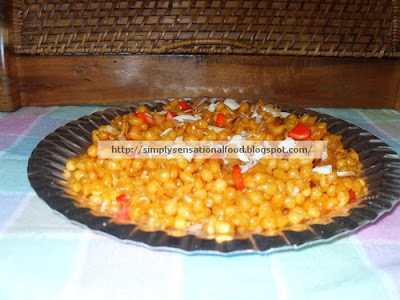 Boondi -A royal dessert made from besan(chick pea flour) sugar syrup and garnished with chopped nuts.Delicately flavoured with saffron and cardamon. 1. In a pan add the 1 cup sugar and ½ cup water bring to boil. 2. Add the kesar, cardamon powder and pinch of food colouring. 1. Sieve the besan flour to remove lumps and add a pinch of food colouring. 2. 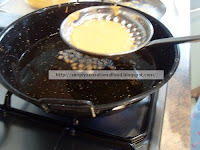 Add 1 tablespoon of melted ghee and make a thick batter using the ½ cup water. 5. Hold the sieve about 2 inches from the oil. 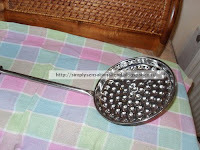 Take a ladle full of the batter and pour small amounts on to the sieve with small round holes. 6.Batter should drop to form small round pearl sized balls. (If you find batter is dropping too quickly forming long strings, batter is too runny add more flour to the batter, on the other hand if batter is not dropping than its too thick so add a little more water to batter. 8. Repeat the procedure till all the batter is used up. Remove from water and skin will slide off. Split the almonds in to halves and than quarters. 10. 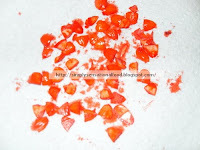 To the blanched almond quarters add 2-3 colours red food colouring ,toss to coat the almonds to colour them red. Place on kitchen paper to dry. 11. 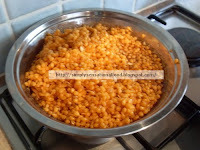 Mix the boondi into the sugar syrup, coating evenly and leave for ½-1 hour for the syrup to penetrate the boondis. 12. After 1 hour pour over the soaked boondi 1 tablespoon melted ghee,add the almond slivers and the coloured red almonds and mix. 13. Transfer to serving dish. Boondi is ready. NB: For boondi ladoos, divide the mixture into 8 parts and make small golf ball sized ladoos from the boondi. You may like: Gulab jamun. Submitted this dish to JFI-saffron event.